In 1941, after the P-39 Airacobra had been in production for one year, Bell engineers began designing a new fighter after limitations became apparent on the P-39. The new plane would be based on its predecessor, but one of the main features of the airplane would be the utilization of the laminar-flow wing. Laminar design was used on the P-51 Mustang, making it the best fighter of World War II. Laminar-flow design uses a symmetrical airfoil that minimizes drag—less drag results in greater speed. The new airplane that finally materialized was designated the P-63 Kingcobra. It was the only USA fighter to begin production and go into combat after the start of World War II. (The Grumman F7F Tigercat and F8F Bearcat went into production after the war started, but they never saw combat.) While the P-63 looked similar to the P-39, it was a larger and heavier airplane. Unlike its earlier cousin, which was originally envisioned as a fighter/interceptor, the P-63 was designed as a ground-support/fighter-bomber from the beginning. The P-63 originated from the XP-39E1 prototype and retained the Bell trademark tricycle landing gear as well as the automobile-type cockpit doors and engine behind the cockpit. The 37 mm cannon that fired through the propeller hub was kept as well as the two synchronized .50 caliber machine guns in the nose and two additional .50 caliber guns located in under-wing pods, similar to the P-39Q. • A new tail unit was installed. • A large four-blade prop replaced the three-blade prop used on the P-39. • A larger cowling was incorporated for easier access to the nose armament. • A second remote mounted hydraulic supercharger was added to improve performance of the single-stage supercharged Allison V-1710-47 engine. The performance of the XP-63A was found to be satisfactory and it was ordered into production in September 1942 with deliveries beginning in October 1943. The P-63A had an internal fuel capacity of 100 gallons and was powered by an Allison V-1710-93 engine. Armament consisted of a 37 mm cannon that fired through the nose spinner, two .50 caliber nose mounted machine guns and two .50 caliber machine guns mounted in under-wing pylons. Not all P-63As had nose mounted machine guns. P-63A-1s and -5s could accommodate a 75 or 175 gallon belly drop tank or a 500 lb. bomb beneath the fuselage. P-63A-6s had racks installed outboard of the wing guns to accommodate two 500 lb. bombs or wing drop tanks. P-63A-10s could accommodate three air-to-ground rockets beneath each wing. The weight of the protective armor used for ground protection increased from 87 to 263 lbs. on the P-63A-10. Bell produced 1,725 P-63As between October 1943 and December 1944. The P-63C featured a distinctive ventral fin below the fuselage. This was followed by the P-63C—the P-63B never went into production. The P-63C featured a distinctive a ventral fin beneath the aft fuselage. The internal fuel capacity was increased to 107 gallons and was powered by a 1,355 hp Allison V-1710-117 engine with an emergency wartime rating of 1,800 hp using water injection. The armament was unchanged and the protective armor weight increased to 201 lbs. Bell produced 1,227 P-63Cs. The P-63A and P63-C were the models produced in the greatest numbers. Only one P-63D was built with a bubble canopy. It was the fastest version of the P-63. Despite being heavier, the P-63D was the fastest version of the P-63 reaching 437 mph at 30,000 feet.6 The wing was lengthened by 10 inches and it was powered by an Allison V-1710-109 engine producing 1,425 hp. A major change was the removal of the automobile-type doors and the installation of a bubble canopy. The performance of the P-63D put it on par with the P-51 Mustang and P-47 Thunderbolt, but it was destroyed during diving tests. This was followed by the P-63E which was identical to the D model, except it reverted back to the traditional canopy and automobile-type doors. Thirteen P-63Es were completed with a contract for an additional 2,930 aircraft, but this was canceled after VJ-Day. Two P-63F models were completed and powered by an Allison V-1710-135 producing 1,425 hp. The F model had an enlarged vertical stabilizer and rudder for improved longitudinal stability. One P-63F survived the war and now resides with the Commemorative Air Force. The P-63F featured an enlarged vertical stabilizer and rudder. 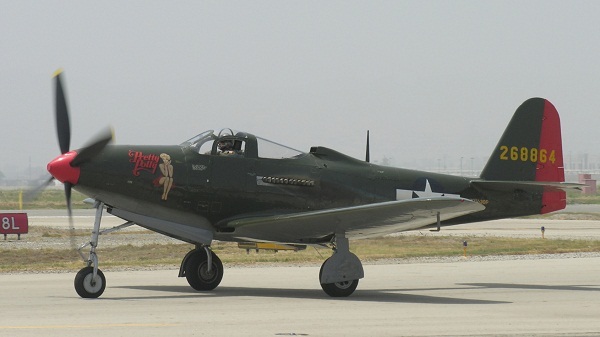 The sole surviving P-63F is owned by the Commemorative Air Force with the registration number N6763. The RP-63A was a specially modified target-aircraft that was fired at with frangible bullets to train large and medium bomber gunners such as the Boeing B-17 and North American B-25 in a program called "Operation Pinball." Frangible bullets were made from an early plastic called Bakelite that disintegrated on impact against the heavily armored aircraft. The armament and normal armor was removed and external armor was installed to protect the airplane and pilot. The external armor was ¼ inch Duralumin skin weighing more than 1,500 lbs. Additional protection consisted of bulletproof glass, steel guards over the exhaust stacks, grills over the air intakes and thick-walled hollow propeller blades. The distinctive large dorsal engine air intake behind the cockpit was removed and replaced with a clamshell duct.7 Despite the precautions taken, some planes were shot down and pilots had to bail out. No deaths were reported from these accidents.8 More than 300 RP-63As were built. The RP-63A was painted bright orange and was a specially modified target-aircraft. The dorsal engine air intake behind the cockpit was removed and replaced with a clamshell duct. The P-63 performance was adequate for low-level fighting and the majority were sent to the Soviet Union. They were delivered via an Alaska/Siberia route as soon as they had left the factory. One of the routes originated at the Niagara Falls factory to Selfridge Field (Michigan) and on to Truax Field near Madison (Wisconsin). P-63s were picked up by (mostly) female Russian pilots who flew them via Anchorage (Alaska) to the Soviet Union. Another route went from Great Falls (Montana) to Fairbanks (Alaska) and on to Siberia. One source states that there were 2,397 P-63As and Cs sent to the USSR, of which only 21 were lost en route and another source records 2,456, of which 2,421 reached their destination. Free French forces obtained 300. The US Army Air Force never used the P-63 in combat, but some were used for fighter training. A total of 3,305 P-63s were produced. • XP-63 2 Improved XP-39E; laminar flow wing. Allison V-1710-47 engine, 1,325 hp. • XP-63A 2 Improved XP-63; bomb racks. Allison V-1710-93 engine, 1,325 hp. • P-63A 1,726 Prod. aircraft; Blocks 1-10. Allison V-1710-93 engine, 1,325 hp. • RP-63A 100 Aerial target aircraft. Allison V-1710-93 engine, 1,325 hp. • P-63B 0 Improved XP-63A (canceled). • P-63C 1,227 Improved P-63A; Allison V-1710-117 engine, 1,355 hp. • RP-63C 200 Improved RP-63A. Allison V-1710-117 engine, 1,355 hp. • P-63D 1 Bubble canopy. Allison V-1710-109 engine, 1,425 hp. • P-63E 13 Identical to P-63D except canopy; new prop. Allison V-1710-109 engine, 1,425 hp. • P-63F 2 Enlarged fin and rudder. Allison V-1710-135 engine, 1,425 hp. • RP-63G 32 Aerial target aircraft; 420 canceled. Allison V-1710-135 engine, 1,425 hp. • XP-63H 1 (cv) Converted P-63E. Allison V-1710-127 engine, 1,425 hp. 1. Enzo Angelucci and Peter Bowers.The American Fighter. Sparkford, England: Haynes Publishing Group, 1987. 51. 2. David Mondey. The Concise Guide to American Aircraft of World War II. New York: Smithmark Publishers, 1982. 17. 3. Alain J. Pelletier. Bell Aircraft Since 1935. Annapolis, Maryland: Naval Institute Press, 1992. 42-43. 5. Lloyd S. Jones. U.S. Fighters, Army - Air Force 1920s to 1980s. Fallbrook, California: Aero Publishers Inc., 1975. 169. 6. Alain J. Pelletier. 44. 7. Enzo Angelucci and Peter Bowers. 52. 8. Ivan Hickman. Operation Pinball, The USAAF’s Secret Aerial Gunnery Program in WW II. Osceola, Wisconsin: Motorbooks International, 1990. 79-86. 9. Vaclav Nemecek. Soviet Aircraft from 1918. Great Britain: Key Publishing Ltd., Nemecek & Schoenmaker, 1986. 58. Howard Mingos, ed. The Aircraft Year Book for 1942. New York: Aeronautical Chamber of Commerce of America, Inc., 1942. Dmitriy Loza. Attack of the Airacobras, Soviet Aces, American P-39s, and the War Against Germany. Lawrence, Kansas: University Press of Kansas, 2002. Larry Dwyer. © The Aviation History Online Museum. All rights reserved. Created November 8, 2009. Updated October 10, 2013.